What makes Medipedia an Investment-Worthy Project? Medipedia is a blockchain-based ecosystem of healthcare services, consumers and providers in which the information of medical patients and institutions is decentralized with the purpose to make it easily and timely accessible to ensure best medical care in all terms. The platform has been designed specifically to help foreign medical tourists with the best guide to medical services and doctors in a foreign country. 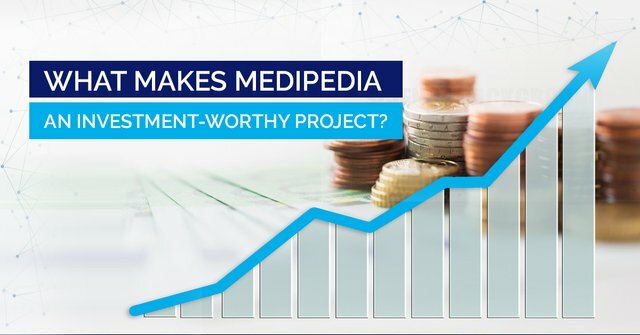 Apart from a built-in translation system, Medipedia offers a range of other benefits and services that make it an investment-worthy project. One of the primary services provided by the Medipedia platform is Matching Service for medical consumers to find and choose the best medical care provider in any country or region. Patients can find the best service options according to their budget and requirements and then connect with doctors for better communication. With Medipedia, you can consult with a doctor or service provider for free by simply creating an account on the platform. All transactions on the platform are stored automatically for future references and user protection. The Medipedia platform will also have a dedicated app for social media and blogging through which the team will provide updates and news of the medical industry for the benefit of the consumers. A bilateral review system enables Medipedia to continuously provide transparent and top-quality services to its platform users. The review system is for the benefit of both consumers and services providers, where a patient can share a review or feedback about a medical institution, doctor or staff from their own experiences, based on which services providers are given ratings and rewards. All economic activities, transactions and records that go through the Medipedia platform are used to make big data to further develop the medical industry and service standards. In addition to medical services, Medipedia also provides tourism related services to help medical tourists find easy accommodation, travel and other related facilities while travelling to another country for a specific treatment. A suitable accommodation, along with the basic facilities, is a priority requirement for medical consumers while visiting a new country for treatment. Medipedia ensures that you get the best services possible. The Medipedia platform has been integrated with an interpretation app that will help consumers connect and communicate with doctors in their own language and also to understand various complex medical terms to present their cases in the best possible way. This is a cost-effective service which is provided by third-party interpretation service providers on the platform. Medipedia is further integrating alliance services on its platform to enable different kinds of service providers to connect with each other in order to provide the best and required services to the end consumer. Medical providers, along with external service providers, will collaborate on the platform for this. Medipedia is dedicated to building a new ecosystem of consumer-oriented healthcare services where medical consumers can easily get access to the best quality of services, irrespective of the location. This is particularly beneficial for foreign medical tourists. These are more than enough reasons to invest in the Medipedia project in the ongoing ICO sale.